A cross-sector, multi-regional group of Lab participants are currently co-developing a prototype to bring electric bamboo bikes to Bhutan. Below is an overview of how this idea came about, and its progress to date. During the sensing journey to Vietnam, Lab participants visited a gifted young craftsman Mr. Tan in Hoi An who comes from a family of bamboo artisans. His father builds traditional bamboo goods such as furniture and houses and Tan has learned the traditional art and craft but designs innovative products, such as a wonderful bamboo bicycle frame. Amongst the participants who joined this sensing journey was Tashi Wangchuk from Bhutan, who has designed a new electric car suitable for Bhutanese terrain, and Vietnamese participants Trinh, Giang and Hang, who are engaged in organic agriculture, sustainable communities, social entrepreneurship, new economics and more in Vietnam. As the group saw the bamboo bike, an idea emerged to bring all these interest together and to create a new product that would bring together all these elements in an integrated way, this is how the idea of “Bambootan, Bike to Happiness” came about. When Giang came to Bhutan for the learning journey in May, she brought with her a bamboo bicycle frame made by Tan. Tashi will use this frame to build the first prototype of Electric Bamboo Bike in Bhutan, and will test the prototype and hope to move it into production by the end of the year. In parallel, the Vietnamese team ordered 6 bamboo bikes (not yet electric) and is creating a bike sharing system in Hue and in Hoi An. Alexander Frederiksen, who has created a bike sharing system and app, is also part of the project and will help with the bike sharing system. Moreover, inspired by Lab participant Nipun Mehta, these bicycle will be available to anyone free of charge, and if people are inspired by this project, they can make a donation so that others can benefit from the same simple joy of riding a sustainable bicycle and discovering the beautiful nature and culture of Vietnam in a healthy way. The bikes will use only local bamboo grown organically and thus empower local farmers to get additional income in a sustainable way. Likewise, the Peaceful Bamboo family, (see http://eurasia.org.vn/ and http://www.tinhtrucgia.ch/) an intentional community where young people with disabilities train in vocational workshops will create a bamboo workshop to create bamboo bicycles. There will be a light mutual technology transfer program between Bhutan and Vietnam. Vietnamese craftsmen will teach Bhutanese youths how to build bamboo bikes and Tashi will teach young Vietnamese how to install the electric component. 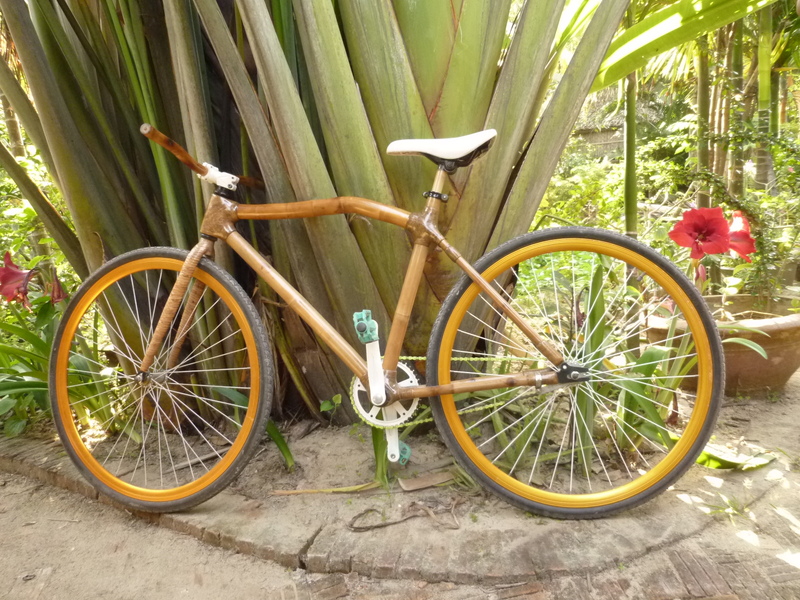 By mid-August 2015, the Bamboo bike scheme will be running in Hoi An and Hue, selling bamboo bikes on the website of Xanh Shop. Tashi, meanwhile, will continue work on the first electric bamboo bike, with the aim of completing it by November 2015. By February 2016, the team aims to host trainings in Bhutan and Vietnam. Team members: Phan To Trinh, Dang Hung Giang, Hang Mai, Alexander H. Frederiksen, Tashi Wangshuk, Ha Vinh Tho. What happened to this project meanwhile? Being a Bamboo bicycle manufacturer myself (smartgrassbicycles.de) I`m very keen to know more about this idea especially because we built some bamboo ebikes ourselfes.